ELIZABETH MARIA LEE was born in 1865 in St Budeaux, then a village suburb on the northwest edge of Devonport. It overlooks the Hamoaze, where the Tamar broadens out before Plymouth Sound and where ships of the Royal Navy anchor. She was the fifth child of Richard Lee and Charlotte Hutchings. Baptism. St Budeaux. October 1, 1865. Elizabeth Maria. Richard & Charlotte Lee. St Budeaux. Labourer on Govt Works. After working on the naval dockyard, her father returned to his previous occupation as a farm labourer. By the time she was fifteen Elizabeth was apprenticed to a dressmaker. On 18 Jan 1888 she married William Wallace Norton in St Budeaux church. He was a sergeant in the 3rd Devonshire Regiment, stationed in Plymouth. Their first home was in Mutley, just north of Plymouth city centre. They may have been living in Mutley Barracks, as Elizabeth was in the 1901 census. They had two children there. 1889 Jan 6 William Wallace. William Wallace and Elizabeth Maria Norton. Mutley. Sergeant, 3rd Devon Regt. In 1891, William was away, probably on active service in Egypt, defending the Suez Canal, as her second husband John Sampson was. Elizabeth and her 2-year-old son are living with her married sister Emma and her new family 9 West Park, St Budeaux. A few months later, a daughter was baptised at St Budeaux. It would appear that William had returned and the couple were again living in Mutley. 1891 June 14 Emily Eveline. William Wallace & Elizabeth Maria Norton. Mutley. Sergeant, 3rd Devon Regt. Although they were then living near the centre of Plymouth, they brought their children to be baptised at the parish church on St Budeaux Green, where Elizabeth’s parents lived. When William Norton retired from the army, the family moved to West Park Terrace. This was on the northern fringe of the city, east of St Budeaux, in the Honicknowle/Crownhill area. Here a third child was born. William took work as a labourer. 1894 Dec 9 Winifred Charlotte. William Wallace & Elizabeth Maria Norton. 8 West Park Terrace. Labourer. Elizabeth’s father died in 1892. In the second quarter of 1896 her first husband, William, also died. On 25 April 1898 she married John Sampson at St Budeaux church. John was also a sergeant in the 3rd Devonshire Regiment. It is quite likely that he was already a family friend. The couple continued to live in West Park Terrace, with Elizabeth’s three children. Eight months later a son was born. Edmer Ismail born 30 December 1898. Registered: Stoke District. Plymouth. Jan 1899. Edmer Ismail. John & Elizabeth Maria Sampson. 8 West Park Terrace. Sergeant. 3rd Devon Regt. Edmer was named after an Anglo-Saxon saint, but from the time when he joined the Royal Marines at 15, he was known as Edmar. In the 1901 census, John is not registered with the family. He must have been with his regiment elsewhere. Elizabeth, pregnant again, was living at Mutley Barracks with three of the children. William, aged 12, was already out at work and not living at home. No occupation is given for these residents. Although John is not at home, he is counted as head of the family, and the relationships stated are to him. Emily and Winifred are Elizabeth’s daughters. 1901 Census. Plymouth. Mutley Barracks. They were baptised on 23 October, not at the family church of St Budeaux, but in the parish church of St Andrew in Plymouth. The family’s address was Mutley Barracks, Hyde Park Road. John had been promoted to Colour Sergeant, 3rd Devonshire Regiment. The book was later claimed by his younger sister Marie, who wrote her name and address: ‘The Green, St Budeaux, Devonport’, on the flyleaf, and her name twice on the pages. There are cruder scribbles and colouring which may be Edmer’s. John Sampson retired from the army in July 1902. He was still under 40, so this may have been due to ill-health. He could already have been showing signs of the cancer that killed him. The family moved to Elizabeth’s old home on the Green, St Budeaux. In 1906 Marie was born. In June that year John died of cancer of the tongue, aged 43. He had suffered a haemorrhage for the past 10 months. At 41, with seven children, Elizabeth became a widow for the second time. The family was left poor. Elizabeth had trained as a dressmaker and the vicar helped her get work, including ‘sewing shirts for soldiers’. Edmar told his children that Elizabeth used to look after two old women on the Green. She would cut them out of the underwear they had been sewn into all winter and give them their annual wash, scrubbing the mould off the back of their necks. 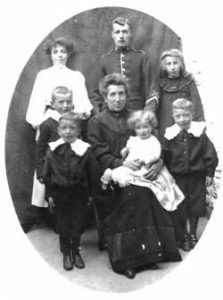 Elizabeth with her seven children c.1907. which educated the orphan sons of soldiers. Edmer was at school in Kent when the 1911 census was taken. Elizabeth was still living on the Green in St Budeaux. 1911 Census. The Green, St Budeaux, Devonport. Elizabeth was a Housekeeper at Home. The three children of her first marriage to William Norton had grown up and left home. William junior had joined the army. The three younger Sampson children were at school. The census also records that Elizabeth had been married to her husband for 8 years and that she had borne 7 children, 5 of whom were still alive. Strictly speaking, only the children of the present marriage should be counted and none of her children had died. Although Elizabeth does not seem to have lost any children in infancy, as earlier generations did, several of her children died in their teens, some of TB. In September 1909, Winifred Norton sent a cheery postcard of her half-brother Edmer in his new uniform to her sister Emily, who was then in Honiton. She describes little Marie as ‘a knockout’. Within a year, Winifred was dead at 15, and Marie died at 18. One of the twin boys, Stanley, died at 19. Winifred Charlotte Norton, The Green, St Budeaux. May 20, 1910. 15 years. Stanley Sampson. The Green, St Budeaux, July 22, 1920, aged 19. Marie died on Nov 21, 1924 and was also buried at St Budeaux. Elizabeth’s eldest daughter Emily continued to live in Plymouth after her marriage to Norris Francis Gooch in 1918. Edmer joined the Royal Marines in Deal. His name was registered then as Edmar, and remained so for the rest of his life. 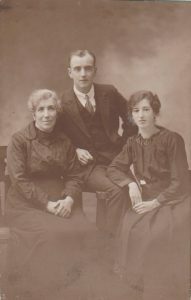 He helped to support his mother and delayed marrying Edith Cory, the girl he had been courting in Deal for many years. In 1930, when he was transferred from Deal to the Plymouth Royal Marine band, they married. Elizabeth must have been in failing health for some years. She had chronic nephritis, an inflammation of the kidneys, which would have had a debilitating effect. She also suffered a series of strokes, resulting in weakness or paralysis of one side of her body. She would have welcomed the help of her daughter Emily and son-in-law Norris. They moved into the cottage on St Budeaux Green with their children, Wallace, Dorothy and Edna (who was always known as Poppy). Elizabeth died March 12, 1932. The causes of death were given as “Hemiplegia. Several attacks”, referring to her one-sided paralysis, and “Chronic Nephritis”. The informant on her death certificate is “N. Gooch, Son-in-law”, who was present at the death. This was Emily’s husband Norris. Mar 17, 1932. Elizabeth Maria Sampson. Agaton Cottages, St Budeaux, 66 years. Twenty-four years later, in 1956, Elizabeth’s son Edmar also died of kidney failure. The remaining twin Sidney joined the Royal Artillery. He married twice. His first wife was Lily. They had three children: Ronald, Margaret and Marjorie. Sidney became a Quarter Sergeant Major and served in India. His first wife died there. The three children were put into a children’s home. During the second world war the home moved to the outskirts of Exmouth, and the children were able to visit their uncle Edmar and his family in nearby Lympstone. Edmar wanted to take the children into his own home, but Sidney would not allow it. In 1941 Sidney remarried, to Iris Le Grys, the superintendent of a children’s home. Iris also had children from a previous marriage, including Jean. They had four more children: Eric, Jennifer, Susan and Stephen. When Sidney and Iris both fell ill, these children, too, with the exception of Stephen, were put into different children’s homes. Margaret, from Sidney’s first marriage had a son in her teens, who was given up for adoption. Emily and Norris continued to live at Agaton Cottages on the Green after Elizabeth’s death. Edmar’s daughter Fay remembers visiting Aunt Em many times during her childhood. The front door was approached from the Green by a path through a small garden crowded with tall plants. There was a step down from the rooms at the front of the cottage to those at the back, which offered an open outlook. The garden sloped steeply away to the Hamoaze, with a glimpse of the navel vessels moored there. There were window seats in the thick walls and rows of gooseberry bushes in the garden. Emily died in the same year as Edmar, 1956. She was buried in the churchyard at Higher St Budeaux, with her mother Elizabeth and half-sister Marie.